You’ve spent years being your own boss. While the experience has been liberating and rewarding, it makes retirement much more challenging when you’ve lived with your job for so long. While traditionally-employed workers simply rely on the retirement programs offering by their employer, it’s up to you to establish a retirement plan for yourself well before you’re going to need it. Luckily, the IRS offers multiple forms of tax-deferred retirement savings programs for the self-employed. These are the primary options you should consider. If you’re working completely on your own, this is the option for you. The IRS allows you to set aside up to 25 percent of your net self-employment income on a pre-tax basis (a post-tax Roth IRA option is not offered); the 2017 maximum contribution is capped at $54,000. All it takes is signing a one-page IRS agreement document and opening an SEP IRA through your financial institution. According to Kerry Hannon of Forbes, this plan offers flexibility by allowing you to add your yearly contribution all at once when you file your tax return. Additionally, an SEP IRA won’t interfere with a company-sponsored 401(k) you may have. On the flipside, it’s not the route to take if you have employees and therefore have more regulations imposed on your contributions. If you do have a couple employees who work for you, a SIMPLE IRA is a viable option. Not only can you contribute up to $12,500 annually to the fund (more if you’re 50 or older), this tax-deferred option is also easy to set up and serves as a nice perk for your employees. Ray Martin of CBS’ Money Watch advises this option if you employ fewer than 100 workers. The only costs that a SIMPLE IRA involves are the fixed 2 percent or matching 3 percent contribution for your employees. This plan does interfere with any other retirement plans, e.g. an employer 401(k), you may have. Another option for those flying solo — as the name suggests — the Solo 401k plan allows the self-employed to contribute a hefty sum to their savings each year, either pre-tax or Roth. 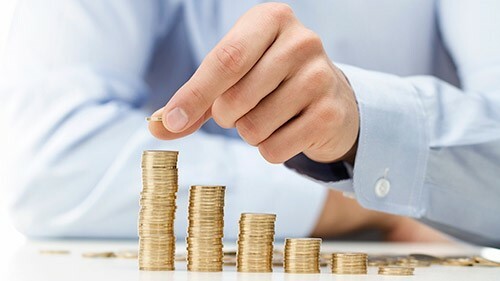 In addition to annual salary deferrals of $18,000 (more if you’re 50 or older), you can contribute an additional 25 percent of your net earnings for a possible $54,000 total. Even for this level of contributions, Forbes’ Hannon reassures readers that annual and set-up fees are generally low. Plus, you can take out a loan against it when you’re in a pinch. If you simply want an old-fashioned pension plan for your retirement, this is the choice for you. According to the IRS, your contributions are calculated by an actuary based on age, expected returns and other factors. When the time comes, you’ll receive an annual benefit based on salary and years of service. Rachel Podnos of Nerd Wallet points out that potential contributions to this plan could be quite high depending on your status, plus it can be combined with other retirement plans and is tax-deferred. Unfortunately, due to the way the plan is set up and ran, it’s expensive and offers limited flexibility. Depending on your particular situation, the IRS offers multiple plans to suit your self-employed needs so that you can be confident in your financial future. Consult your financial advisor to get retirement advice tailored to your situation.